There are hundred and thousand of merits of internet but the biggest one is online shopping. I prefer online shopping because you can easily avoid crowd while you shop and during festivals and special occasions, the crowd can really give you a bad headache, forcing you to make hurried purchases often times and you have a hard time to find parking space also. Following things I found the best on this portal. The very first thing that is striking about this site is that the entire website is well designed and you need not to struggle to search something specific. 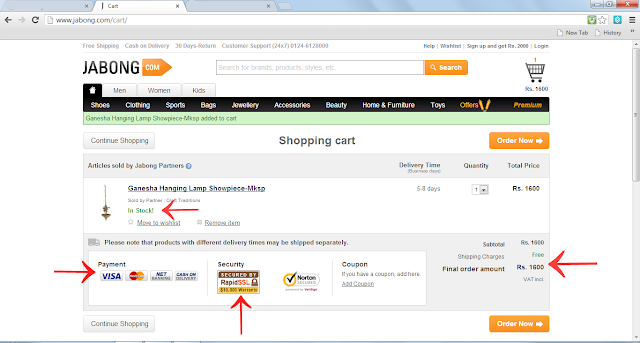 Home page has a big search button (highlighted in red) right after company's name. 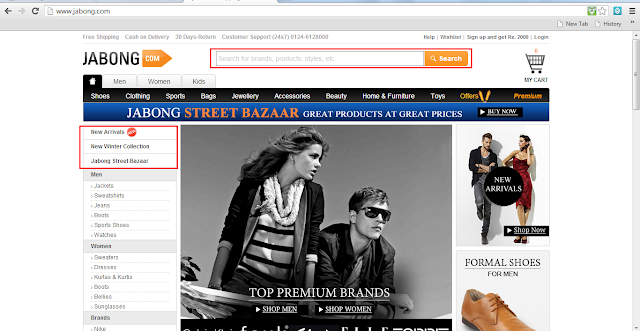 There is information about new arrivals and Jabong street market on top of the left panel. I liked the way they have categorized all the products in three main categories....Men, Women & kids. 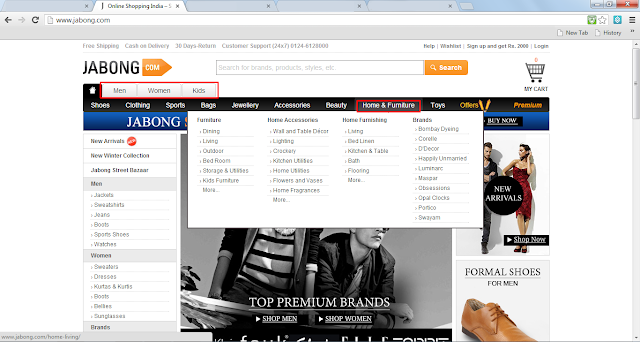 Under each category there are sub categories like shoes, clothing, bags and lot more. 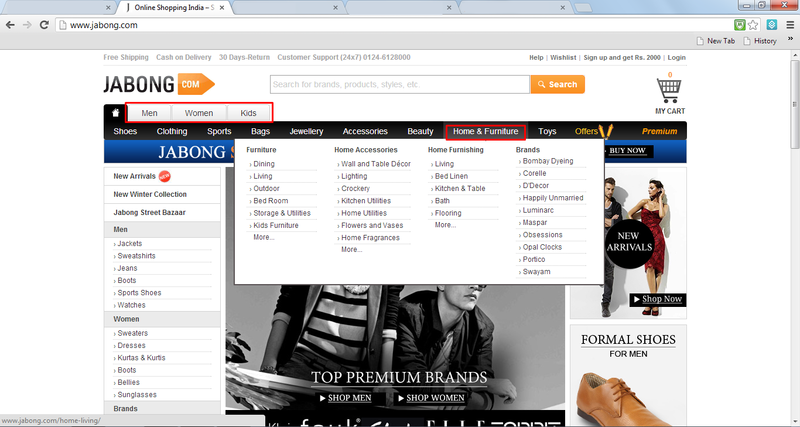 Hover your mouse on sub category and there will be a systematic list of products like I hovered mouse on 'Home & Furniture' and list of Furniture, Home Accessories, home Furnishing & Brands appeared. Choose your product from right here no need to open page after page. See it's hassle free. 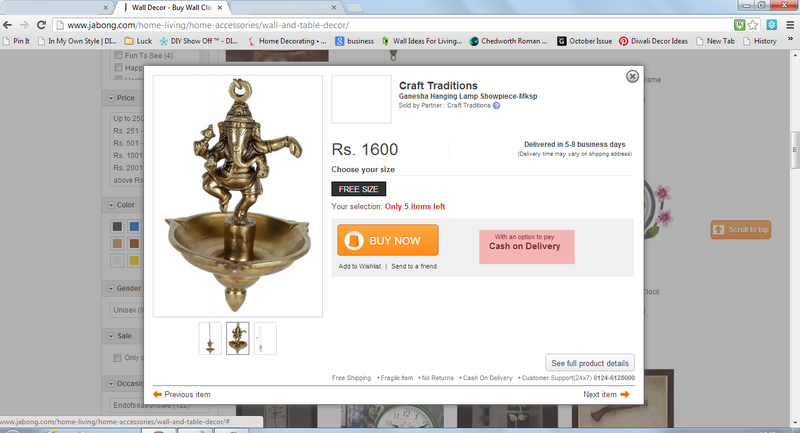 After clicking on 'Wall and Table Decor' from the list under 'Home Accessories' I landed directly on the page shown below. 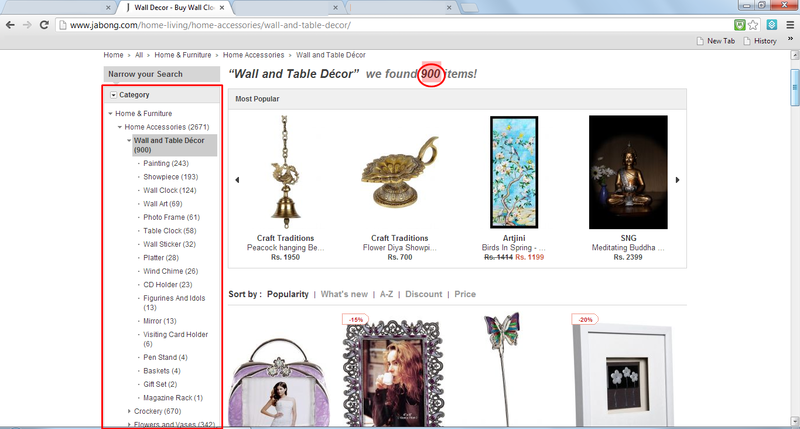 Can you see I found 900 Items. There were so many good possible choices available that it was difficult for me to make a decision. I am sure you will be spoiled for choice. Name the brand and it is available. Also one can get the latest trends from around the world without spending any extra money on airfare. 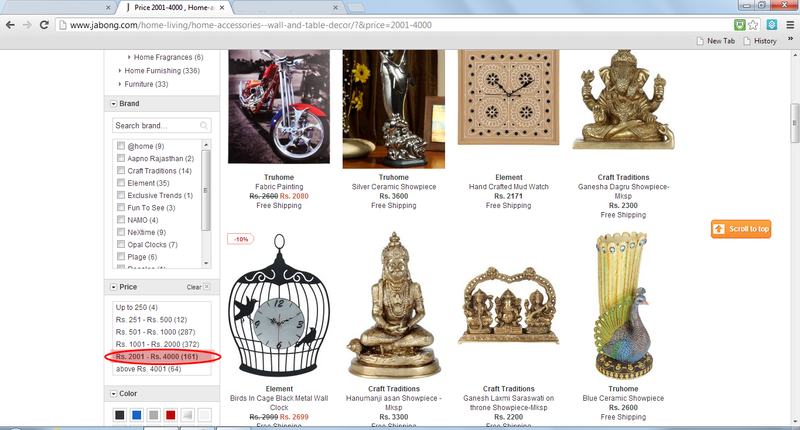 The best part was that I could narrow my search by clicking on the options given on left panel. Shop according to your budget click on price range given on left panel. No need to scroll down a long page of products those are not of your interest or are heavy on your pocket. Simply choose your product, brand, color and price range from the left panel to narrow your search and save your valuable time. There is one more option to save your time is 'Quick View' to see the product description and its price quickly. The next thing that amazed me on this site is the product display. 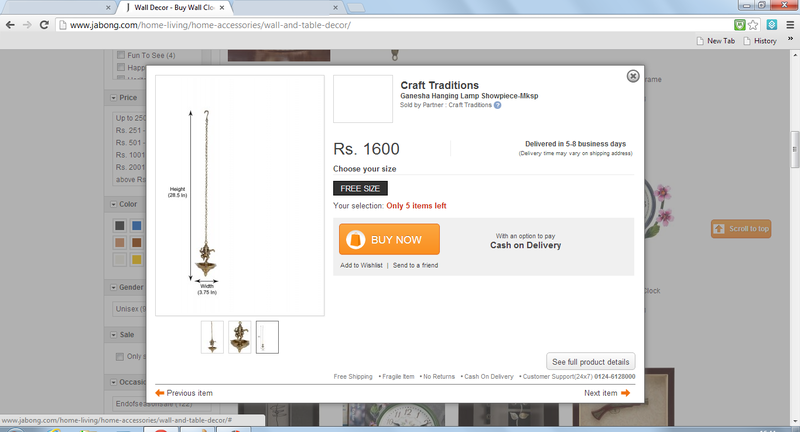 As soon as I clicked 'Quick View' a pop-up window appeared with all the details about product. Everything about product was given here like brand, price, availability, size, payment options and most importantly pictures with different views and all the dimensions. This is the another view of product with dimensions. You need not worry about your confidential information as their payment gateway is secured by RapidSSL and Norton powered by VeriSign. So no worries go ahead and pay without thinking twice. Place your order just in few clicks. Then you'll be ask to sign up for a permanent online account so that some or all of your information only needs to be entered once. Enter shipping address and then pay. 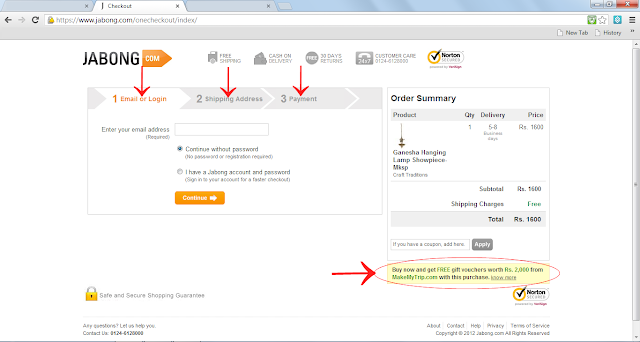 That's not all you will receive some discounts or offers also while checking out. You will receive an e-mail conformation after transaction is complete. After putting your order you will receive your order within 5 working days through reliable courier services with proper packing. It was my wonderful experience with Jabong from start to finish. 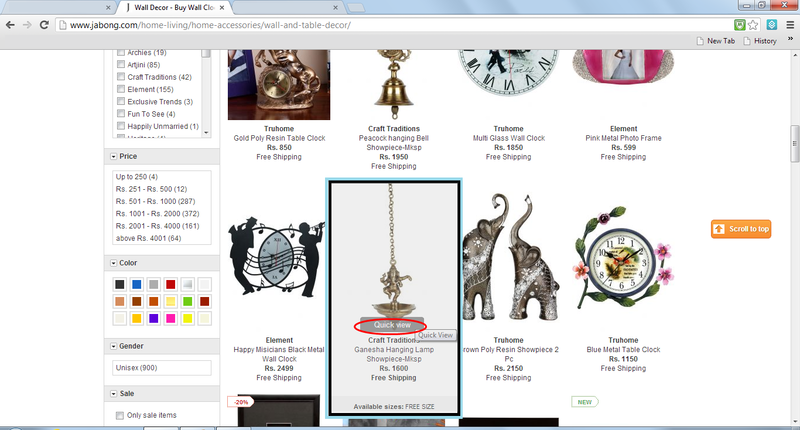 Now my request to all the bloggers and shoppers 'Go on shop on Jabong and speak your mind'. This post is a part of Jabong Bloggers Contest. A pioneer in online shopping in India, Jabong.com promises to fulfill all your style based needs through its wide range of lifestyle products for men, women & kids. Fantastic work !I have read so many content concerning this topic but actually I liked this post so much ..good work keep it up!